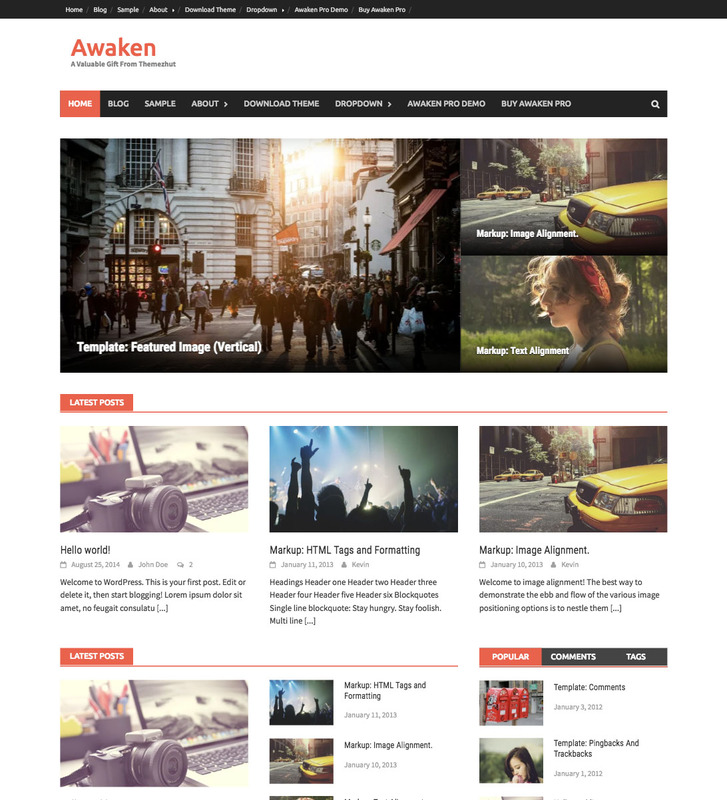 Awaken is an elegant, clean, responsive, retina ready WordPress theme created for magazines and blogs. If you are looking for a modern style theme with great customization and monetization options this would be perfect for you. It has a great magazine layout with three different style post block widgets, enabling you to display posts in different categories or display latest posts. Theme customizer panel lets you to easily customize the site without any extra effort. This theme is built with twitter bootstrap framework. So this theme can be viewed on any viewing environment like mobile phones, tabs and desktops perfectly. Awaken has featured widgets to display posts in different styles in the magazine layout. Following is a list of widgets included with this theme. Awaken Single Category Posts Widget. Awaken Two Block Posts Widget. Awaken Three Block Posts Widget. Awaken Popular Posts, Comments, Tags Widget. Awaken theme has included a featured posts area to display posts in modern style. It is made with flexslider to display posts in a responsive slider. Customizer panel facilitates you to easily customize your theme without any extra effort. Go to “Appearance > Customize” from your dashboard to customize your site. This theme like our other themes released under general public license. It lets you to change the code and customize your theme as you wish without any restriction. Fixed a issue in mobile menu. Changed redux framework embeded option to plugin option. Fixed a issue in featured slider. Added linkedin social link to the header. Added Editor Stylesheet to the theme. Added Post options section to Awaken Options Panel. Now you can turn off featured images in single posts. Added switches to turn on or off comments on pages or posts. Small update to fix html validation issues. Fixed some issues in comments activate deactivate methodology. Added options and settings to the theme customizer. Added a theme info page. Fixed the slider and footer not displaying issue. Changed archive title for categories and tags. Fixed Google Plus icon not displaying issue. Removed checking useragent for html5shiv and used wp_script_add_data instead. Removed unwanted file_exists check for admin-config.php. Added a method to display sticky posts for the two featured posts that are just next to the slider. Removed old theme filtering tags and added new tags. Added "header ad" widget area to header. Changed widget post titles "h1" tags to "h3"
Changed blog listing titles "h1" tags to "h2"
Fixed undefined variable issue in magazine widgets. Added the previously removed theme section again to the customizer. Changed slider h1 tags to h3. Passed fonts url to editor stylesheet. Added some stylings to the search form. Fixed a small slider issue. Added Woo Commerce 3.0 Support. Added the WordPress default date formatting support for posts widgets. Fixed a issue in navigation for RTL language. Modified widgets for customizer display. Added slider support for magazine template. Fixed structured data errors showing on Google search console report. 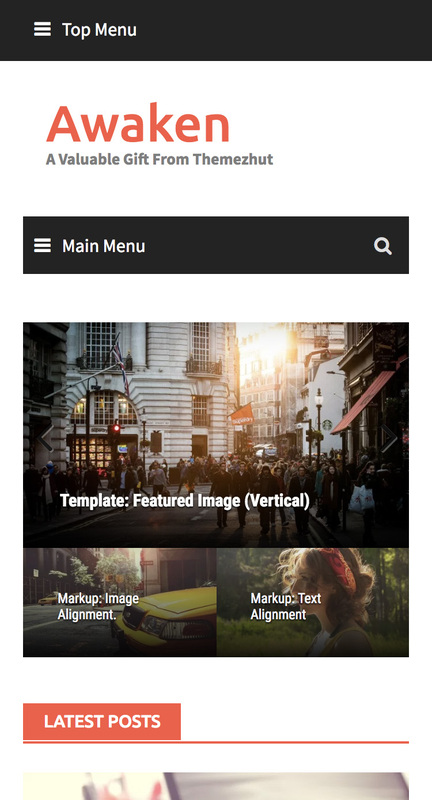 Added theme starter content support. Added customize selective refresh support for widgets. Changed sidebar widget title "h2" tags to "h3"
Renamed widget control "Hide sticky posts" to "Ignore sticky posts". Changed HEADER_TEXTCOLOR to use add_theme_support('custom-header).